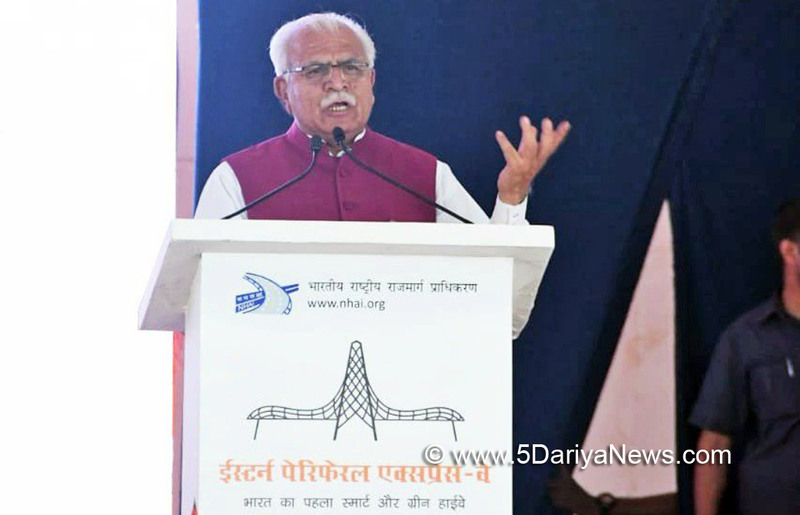 Haryana Chief Minister, Mr Manohar Lal said that the Prime Minister, Narendra Modi will also dedicate major projects including Western Peripheral Expressway, Metro line from Delhi to Bahadurgarh, Haryana Vishwakarma Skill Development University as he will be requested soon to spare time for the inauguration of these projects.The Chief Minister was addressing the gathering at the inauguration of Kundli-Ghaziabad-Palwal Expressway in the presence of the Prime Minister at Baghpat in Uttar Pradesh today.Mr Manohar Lal thanked the Prime Minister and said that construction of this 135-km long expressway has begun a new era in the field of infrastructure. He said that soon Western Peripheral Expressway would also be completed and the total length of 270 kms road of these two Expressways would be the longest road in any country of the world.He said that the Prime Minister has also inaugurated a digital gallery related to this Expressway today, which has all the information regarding its construction.Mr Manohar Lal said that the Central Government has completed four years on May 26 and entered into fifth year. During the period, massive developmental works have been undertaken bringing changes in the system. In the fifth year, the accelerated pace of development would get new direction with the coordinated and dedicated efforts of all of us, he assured. While congratulated the Union Minister of Road Transport and Highways, Mr Nitin Gadkari on his 61st birthday, he said that the foundation stone of this expressway was laid in Kundli of Haryana and today the Prime Minister is dedicating it to public. He said that Haryana and Uttar Pradesh have close relationship which would further be strengthened. Lord Krishna was born in Uttar Pradesh, and Kurukshetra was the land of His Karma (Karma Bhumi).”He said that the foundation stone of Chhachhrauli Bridge had been laid and its tenders would be opened by coming June 5. He said that in the last three-and-a-half-years, a sum of Rs 35,000 crore was approved for nine national highways for strengthening infrastructure sector in Haryana. He said that with the construction of both Eastern and Western Peripheral Expressway, the people of Delhi would get a big relief from traffic congestion and this expressway would play an important link between North India and South India. He said that these Expressways would induce development and also open opportunities of investments. He said that both Haryana and Uttar Pradesh are mainly agricultural States and good relations have been developed in culture, infrastructure and other areas in both the states besides strengthening Mandi infrastructure. He said that recently, detailed deliberations were held with the Chief Minister of Uttar Pradesh, Mr Yogi Adityanath on law and order in both States, after which, police personnel of both the States are working in coordination with each other which has succeeded in controlling criminal activities. This coordination in both the states would continue in future also, he added.He said that the Union Minister for Road Transport and Highways, Mr Nitin Gadkari has said that in the next 10-15 days, work on Dwarka Expressway that links Delhi and Haryana would begin. He said that the expressway would be constructed at the cost of Rs 7,000 crore.Those present included Governor of Uttar Pradesh, Mr Ram Naik, Chief Minister of Uttar Pradesh, Mr Yogi Adityanath, Union Minister of State for Social Justice and Empowerment, Mr Krishan Pal Gurjar and Union Minister of State for External Affairs, Gen. (Retd.) Mr V.K. Singh.